Well, I was working on a different Nuance #2 - the upcoming release of Juan Solera / Palm and Play's documentary "Blame Game" (former working title Clean Hands). But before I could make an announcement, another German White Savior documentary has just been released! "Welcome to Sodom" makes Awal Muhammed (and perhaps fellow Musketeers Yaro and Razak? Didn't see them in the trailer) return for another one of his tire-burning-circus acts. In fairness, I have only been able to see the trailer. But hey, here's the same theme. Agbogbloshie in Ghana is presented as "Europe's Ewaste Dump". Shots of girls with water baskets on their heads. Shots of garbage being dumped (not even electronics) through a frame of a 1970 television husk. But if the trailer and website is any indication, our hero is, once again, Awal Muhammed of Savelugu (north of Tamale) Ghana. Here he is with his gasoline-filled-tire-burning-act (previously seen on Placebo's MTV video last year). This is not something they do - use this much fuel to make this big a fire - except when European camerapeople are present. Awal is credited with figuring out that it's the fire that brings the cameras for your close up (a hint for Hollywood Extra Wannabees, perhaps). Again, all I've seen so far is the trailer. I hope this documentary surprises me. So far, not so much. Here is Awal taking a bath. Here he is using 4 times the lighter fluid he usually needs for the wire burning shots. There's a shot of him doing jumping jacks with smoke in the background, shots of him pulling the wheelbarrow. I have to hand it to Awal, he seems to have figured out that Michael Anane was making a lot of money to bring documentary filmmakers, and he can attract them himself, and at least get a lunch or some better tips out of it. 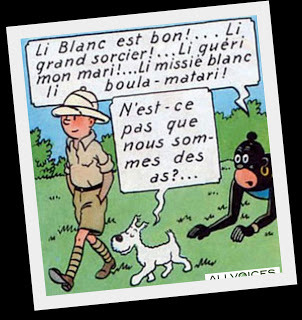 I don't speak German, but I recognize "Ils sont fous les blancs" when I see it. "Die Weissen haben einfach zu viel Spas" = "These white people are just too much fun". In Part 3 (assuming no further surprise appearances by the Scrap Boys), I'll talk about another documentary which actually investigates the "premise" that Agbogbloshie is a dystopian European waste dump. But do go back to Nuance #1 if you haven't seen my own cheap interview with Emmanuel Nyaletey and Awal in 2015. I hope Christian Krones and Florian Weigensamer don't bristle and react to my blog the way @ItsSashaRainbow did. I do understand, having worked with authors and reporters and documentary filmmakers, how much of their heart and soul goes into these films. As I said last year, photojournalism's credibility is, in a way, a large part of the Collateral Damage or Friendly Fire. That will be my own documentary title, should I run into some time or a sponsor or develop some editing talent that I have yet to demonstrate. One thing I have learned is that since I don't make a living as a reporter or documentary filmmaker, I have time. I don't have to be the first. I can take time and digest, and am constantly fine-tuning the points I made on this blog, for example, ten years ago. The best reporters I have met like to go back to a place another time or two, to see what they may have missed, to refine their initial impressions (Adam Minter). Or datajournalists (like Jacopo Ottaviana) go to find World Bank data, or published professorial research (Josh Lepawsky). Alexis de Tocqueville, or TinTin? You decide which kind of reporting you want. "N'est-ce pas que nous sommes des as?" or, "Are we not asses"? All kidding aside, Agbogbloshie is the city dump and scrap recycling yard for waste and junk appliances and auto scrap collected from the City of Accra. It is near the center of Accra, on land which has been in dispute for a couple of decades (the commercial value of the land to developers is growing, much higher than the value of the slum dwellers businesses and shantys). It has been written about for decades in professional development journals... I learned a lot by looking up "urban development", "water pollution", "electricity use per household", non-ewaste terms, which leads to very well researched (and often boring) articles funded by IMF, World Bank, UNDP, etc.